Psalm 119:148 My eyes awake in the night watches, that I might meditate in Your word. 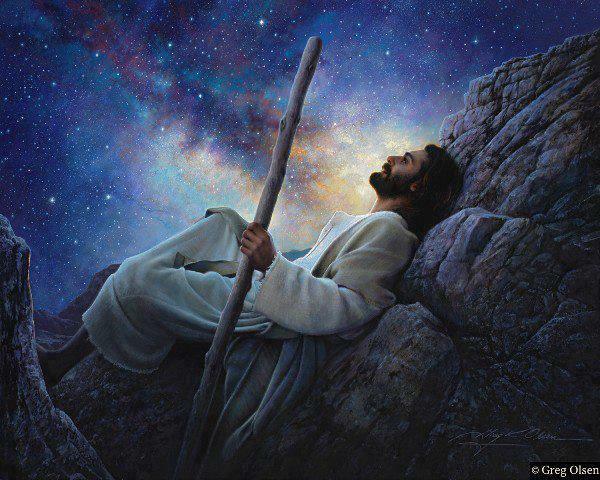 Psalms 63:6 When I remember You upon my bed, And meditate on You in the night-watches. Luke 2:6 While they were there, the time came for the baby to be born, 7 and she gave birth to her firstborn, a Son. She wrapped Him in cloths and placed Him in a manger, because there was no room for them in the inn. 8 And there were shepherds living out in the fields nearby, keeping night watches over their flocks. Lamentations 2:19 give cries in the night, at the starting of the night-watches; let your heart be flowing out like water before the face of the Lord, lifting up your hands to him for the life of your young children who are falling down, feeble for need of food, at the top of every street. Many times I have been awakened in the middle of the night feeling the urge to pray and I get on my knees when this happens and sometimes I prayer walk through my house and just allow the prayers to flow out of me. I don't even question it. We serve a mighty Father and He is the Lover of our souls. He watches over each one of us day and night. I hope as all of you read this you are as blessed as I am. I hope you have a Simply Heavenly day!!! God bless you!!! I believe in Night prayers too! Though I must admit I do not maximize all those moments when The Holy Spirit wakes me up. Thanks Kelekiai and Ann for this insight.